It is possible to improve your color knowledge by reviewing this free program now! Choosing color is one of the most satisfying yet challenging decisions in painting. 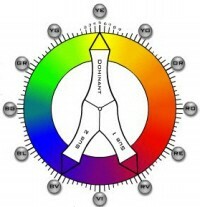 The TCS Digital Color Wheel is the tool to help you solve your most difficult color issues. You can put life into your projects by developing and improving your understanding of color. Choose from Complementary, Split-Complementary, Triad, Tetrad (5 Choices) and Analogous. Adjust your preferred Hue, Clarity and Value and select from over 10,000 colors and shades. Then Click "Expand Color Scheme" and see Dominant color, shades, highlights all your color choices in a 3/4 size full screen. VIEW SELECTED HUES then paint a design right on your computer screen. ADJUST CLARITY & VALUES to create dimension and highlight the center of interest. CHANGE BACKGROUNDS to acheive the best relationship with your design. To use the TCS Digital Color Wheel, register one time only, then immediately we will e-mail you complete step by step Quick Log-In instructions. Any time you want to enter the program, enter password at "Quick Log-In field only". Register now. Try-it Yourself with our Complimentary User Access! TCS© - Industry Standard Color Match Solutions. The same TCS # 's in different brands are always matching colors. TCS Color Solutions for every artist!